Tales of the Trees: Congratulations Giants! When Luke and I first started dating I wasn't a big football fan. Sure the games were a fun hang out place in high school, but I never really understood the game. After I started dating Luke that slowly began to change. He is a huge football fan, which means during football season it consumes his life. He watches it at home, listens to it in the car, talks about it with friends, and when we go to a restaurant we have to eat at a table that faces a TV. So I had to make a decisoin, I could either dislike football and make myself miserable during the season, or I could embrace the sport and find a spot for it in my heart - so that is what I did, and much to my suprise I fell in love with it. I love football, it is so exciting! College, Professoinal it doesn't matter (although I will never understand why we have to watch the football recap on ESPN, right after we watched the game, it will never make sense to me) Luke's favorite team pretty much his whole life has been the NY Giants. 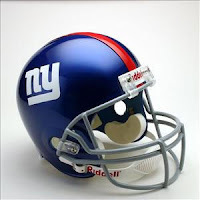 So due to assocation, I have also taken the NY Giants as my favorite team. I must say I didn't think they had a chance at the Super Bowl, but Luke has always reamined hopeful. Well this year they are the champs! Congrats Giants! Thank you for winning! I didn't want to have to watch Luke pout for the next month...... So Happy!